Juice is one item that is always on my grocery list. Both my kids and John love juice and it seems I can’t keep enough of it in the house! I know that not all juices are created equal and I prefer to buy juice that offers both nutritional benefits along with a great flavour. Oasis Juices is a brand that is often in my shopping cart. Not only do they offer a delicious selection of juice products, but they also full of vitamins and minerals. Plus, my family enjoys drinking them so I follow their lead and buy what they like. Oasis Classic has been a staple in many fridges (including ours!) for over 30 years. I appreciate that they are 100% pure juice with no added sugar. There’s loads of flavours to choose from like Wildberry, Orange, Pineapple, Tropical Passion and more. Oasis Smoothies are the perfect way to start your day. Each glass contains two daily portions of fruit, vitamin C and no added sugar. The flavour combinations are divine and include Strawberry Banana, Pineapple Banana Coconut, Tropical Mango and more. For a juice rich in antioxidants, try Oasis Nutrisource. They are 100% juice blends and low calorie cocktails both containing antioxidant vitamins C & E or polyphenols. I’m looking forward to trying the Wildberry Pomegranate Antioxia blend. You can check out all the other fabulous Oasis juices on their site including recipes! My favourite is this Berry & Pomegranate Smoothie. Easy, healthy and delicious! 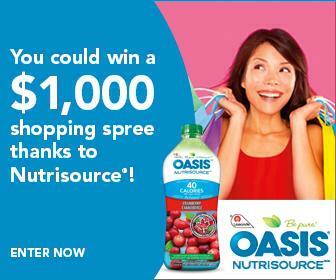 Oasis Nutrisource is also giving away a $1,000 shopping spree. Better yet, there’s going to be 10 lucky winners! 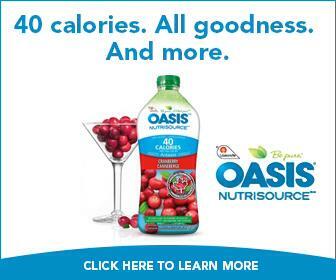 Visit Oasis Nutrisource to enter and you’ll also be able to receive free online coupons. 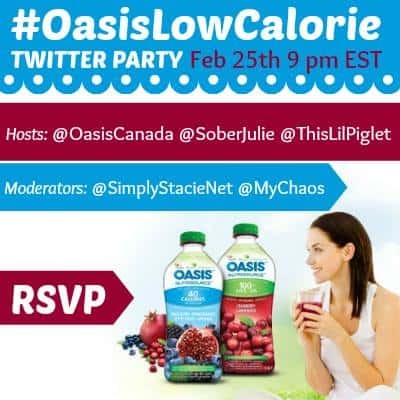 Join us on February 25th at 9pm EST for the #OasisLowCalorie Twitter party! Follow the hosts and moderators and add your Twitter handle and link to the linky below. Then join us on the 25th at 9pm EST with the party hashtag on Twitter and prepare for an hour of fun and prizes. See you there! I love Oasis! This should be a fun party!